Thinking of Purchasing a Boat Far From Your Homeport? So, you’ve been searching for that perfect boat for a while. You started off looking close to home, seeing what the local harbors had to offer. Next, you decided to see what was available in the next state, and before you know it, you were searching halfway down the eastern seaboard! You think you have found the one. It has everything you are looking for and more, and the price makes it worth the effort. Now, all you need to figure out is how to get it back to your homeport after closing. There are a few main considerations when making this decision: expense, time, experience, and wear and tear. For most people, this will come down to expense. Does the fuel expense, marina dockage, plane flights and the cost of bringing crew outweigh what it would cost to have it transported over land? Always remember to add in a budgetary cushion for the unpredictable because as we all know, if anything is going to happen, it’s going to happen out there! If by overestimating your delivery budget you still think you can undercut the shipping company’s quote, get ready to request some vacation time. If you can take a week or two off to move your boat from down south up to New England, it could be the adventurous maiden voyage you were dreaming of. But if things don’t go as planned and mechanical issues or bad weather delays your trip, you could be looking at leaving your boat in an unfamiliar boatyard to be worked on by questionable mechanics, only to hope they fix your issue in time for you to come back in a few weeks to give it another shot. If you decide this is the way you want to go, there are a few things that you can do to minimize risk. Hopefully you have a fresh pre-purchase survey in hand, so of course, address the big things. Engine(s) running smoothly? Thru-hulls all work? How about the shaft glands? Probably the number one issue that stops a boat short on a delivery with a new owner is bad fuel. There is the probability that the boat has been sitting for a year or more, and microbial organisms have been growing in your fuel tanks. The boat sea-trialed fine on the calm day you went out, but now you are pounding around in some heavy chop and the tanks are getting stirred up. If you’re only going a few hundred miles, a box of fuel filters and the know-how to change them underway should get you home, but if you’re planning a long stretch, inspecting and cleaning the tanks is in order. If you are buying a twin-engine vessel that will be guzzling diesel, you may want to have the surveyor test the fuel for water and bacterial growth, and also inspect the tanks. Did you purchase a sailboat? Most surveyors will only inspect the rigging from deck level. Before you go offshore you should have a professional rigger do a top-to-bottom inspection of your rigging to be sure it’s up to snuff. This would be another item to be sure is included in the terms of your purchase process before accepting a distant vessel. An alternative option is to hire a delivery captain. Depending on the size, type and condition of the boat, and the route and length of the delivery, a qualified captain will cost anywhere from $250 to $500 per day. For experienced crew, an additional $150 to $250 a day is common. Delivery captains know the routes to take in various weather conditions, can competently sail through the night (with the appropriate crew), and are able to deal with situations, mechanical or otherwise, that a new boat owner would not. The ability to log many more miles a day and save you money on things such as where to get the least expensive fuel and where to anchor for the night instead of paying dock fees can quickly help pay for their services. Boat brokers and shipyards are usually the best source of information when trying to locate a local captain to trust with your boat. Hiring a captain to move your boat traditionally has been a very informal affair. More recently, however; contracts are being used by captains to clearly lay out responsibilities of boat owners and captains before, during and after the delivery. What is paid to the crew if there are weather or mechanical delays when the boat is tied to the dock? What is the per diem allowed to the crew for food, travel and other items? All of these things should be discussed and agreed upon before the boat leaves the dock. To be sure your insurance will cover you in case of an incident, call your agent and ensure that your policy covers waters to be transited and that the captain meets requirements. If shipping by land, boat dimensions will be the single most limiting factor in where you can go and how much it will cost. For most roads, the vertical height limit from pavement to top of boat will be 13’ 6”. The boat’s beam will determine what route you will need to take. Beams up to 20 feet are possible if the right road surveys are available, but this may be a roundabout route and end up costing lots of money. Transport companies are experienced in getting these permits and finding the right route for your boat. However you end up bringing your new boat home, it will take some thought and consideration. This will be her first journey under your ownership, but certainly not her last. 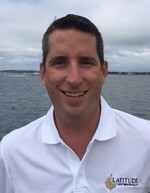 Tom Miller is a yacht broker with Latitude Yacht Brokerage, LLC in Newport, RI. Tom holds his 200T USCG and MCA captain’s licenses and frequently delivers power and sailboats up and down the eastern seaboard, having recently brought a 55-foot sailboat from Saint Martin to Newport. Call Latitude at 401-560-0007 and ask for Tom if you’re looking to buy a boat outside your homeport and need assistance, or email him at tom@latitudeyacht.com. On Watch – Shelley Brown, Ph.D.